Several more fall birds have arrived. House Wrens, Least Flycatchers, Yellow Warblers and Mourning Warblers have been seen in our backyard this past week. Of the four listed only the Mourning Warbler does not breed locally. It is a nester of the Boreal Forest and can be seen at Greenwater Provincial Park in the summer time. 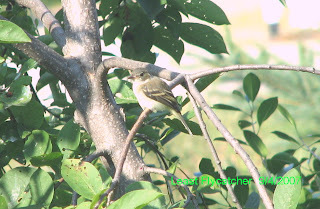 The other three are local nesters of which only the Least Flycatcher requires larger tracts of woods such as those found along many of our creeks and ravines. A good place to find one of these nests (never an easy task) is along Milligan Creek near the visitors’ centre. The other two have nested in our backyard. In the spring and fall they all invade our backyards providing us with more or less effortless viewing. This week I have chosen to write about a very common summer resident, the Least Flycatcher as my main subject of interest. I have seen one every spring and fall without fail and managed to get some very good pictures one of which included in this week’s article. As mentioned in Article No. 30, the flycatcher family is quite varied. The small brownish grey ones with white eye rings and two whitish wing bars are called the Empidonax Flycatchers (empids for short). Of all the birds in the world, the empids are the most difficult to identify. Why? There are eleven different species and all look pretty much the same. So, how does one tell them apart? First, use the range maps provided in bird books as a guide. For example, of the eleven different species only five are found in Saskatchewan and only three around here. Second, nesting habits of the different species are somewhat different. Third, and best, is to separate them by their song in the spring when the males are claiming territory. A birder does have to become familiar with the different songs, though. In the fall, however, the empids are silent and identifying them is almost impossible. Imagine living in southern Ontario and trying to identify fall empids when five species breed locally and in the same areas. In the fall even the experts have to give up and simply refer to them collectively as empids. Fortunately, the only empid that nests locally is the Least Flycatcher. Any small woodlot of several acres will sustain a nesting pair. This flycatcher can be readily identified by its call even before it is seen. Its loud and emphatic chebeck call is instantly recognizable. Of all the empids it is the only one that has a really bold white eye ring, which, in the fall, is its only easily identifiable characteristic, relatively speaking. For the experienced birder, this little grey passerine (perching bird) is easily recognizable as a flycatcher. The rest is in the details. For the novice, find an experienced birder to help you out. Have fun with this one.